Announcement Award winning designs shown at art shows. All scarves are carefully wrapped with tissue paper and foil which can easily be presented as a gift. Award winning designs shown at art shows. All scarves are carefully wrapped with tissue paper and foil which can easily be presented as a gift. Beautiful color silk scarf! I love it! Thank you! lovely scarf, in excellent condition, and it arrived promptly. Thanks! Plenty of ideal Mother’s Day gifts in floral, Boho, and classic designs. Free shipping available! 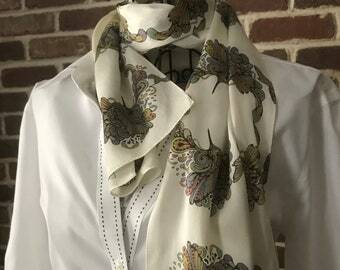 More vintage designer scarves being added every day. Now get a free scarf ring with your purchase! While supply lasts. Video summary: Find fresh and breezy designs atScarfSherpa! ElectrickInk art wear scarves are original designs that are bold and meant to reflect personality or expression. The designs are a match for people who use clothes and accessories as an artistic amplifier of themselves to the outside world. A one stop production facility that specializes in making quality custom products on demand.